The Lipstick Economy in Iran. Really? It seems like a contradiction that Iranian women in compulsory veils are avid buyers of make-up, seek out cosmetic surgery and go to house parties to buy fashion. Thousands of Iranian women are even taking off their veils and publishing pictures of themselves on a Facebook page set up by a London-based Iranian journalist, triggering a debate about the freedom to wear or not wear the hijab. Only posted in May of this year, the site has attracted thousands of likes. Iranian women are pushing boundaries, with long held memories of freedoms past. They are entering universities and professions in record numbers. Maybe lipstick is just the first bright spot in the fundamentalist culture. 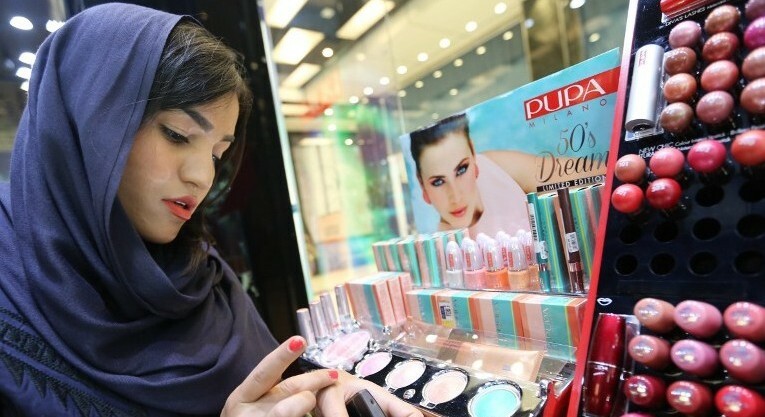 Believe it or not, Iran is the second-largest cosmetics market in the Middle East in terms of revenue, behind Saudi Arabia, and the world’s seventh biggest. Women in Iran may wear more make-up than in some western countries. The Islamic tradition in Iran does not prohibit perfumes or cosmetics. It is said that even Mohammed wore perfume. So, one’s face and make-up are their own form of personal expression in a world of covered heads and loose clothing. Now, with a female population of more than 38 million women, the cosmetics industry, despite the economy, is booming. Some estimate the market at several hundred million dollars, much of it in the grey market. Recently the French luxury brand Lancome recently announced a return to Iran after decades away. It is the first time since the 1979 Islamic revolution that a major Western brand has had such a heralded comeback. No American brands have been sold in Iran since the US embargo of the 1980s. Cosmetic professionals estimate that Iranian women buy approximately one tube of mascara per month, compared to only one every four months bought by the French. Iran has a large youth population, most of whom still live with their parents, allowing them money to spend on discretionary small luxuries like make-up. The desire for facial beauty does not stop there. Iran has the highest rate of nose surgery in the world. Young people are having cosmetic surgery in the hope of attaining facial features like the actors they see in Hollywood films and Western satellite television programming. This focus on beauty seems to be more than a reaction to the restrictive society in which women in Iran live. House parties at maisons with boutique clothing have cropped up all over Iran. Located in homes of the underground merchants, they allow Iranian women to shop and socialize outside of the oppressive societal rules. They can take off headscarves, shop for clothes and visit with friends. And bring a type of societal freedom to their lives. § One Response to The Lipstick Economy in Iran. Really? You are currently reading The Lipstick Economy in Iran. Really? at The Lipstick Economy.